Samsung UN55KS9500 vs UN55KS9000 : What is the Reason to Consider Samsung UN55KS9500? Posted on Tuesday, March 29th, 2016. - Filed under 55-Inch. UN55KS9500 and UN55KS9000 are two choices from Samsung that you should consider when you are looking for the best 55-Inch Smart 4K UHD TV for your home. Samsung UN55KS9500 is positioned as the model above Samsung UN55KS9000. But how about the comparison of those two TVs? I’m quite sure that you need to know that if you consider those two TVs as your new TV model. This article will try to make a comparison between Samsung UN55KS9500 and UN55KS9000 as well as see what is the reason to consider Samsung UN55KS9500 as the higher model. Samsung UN55KS9500 is positioned as the top model (flagship) for 55-Inch LED TV for 2016. 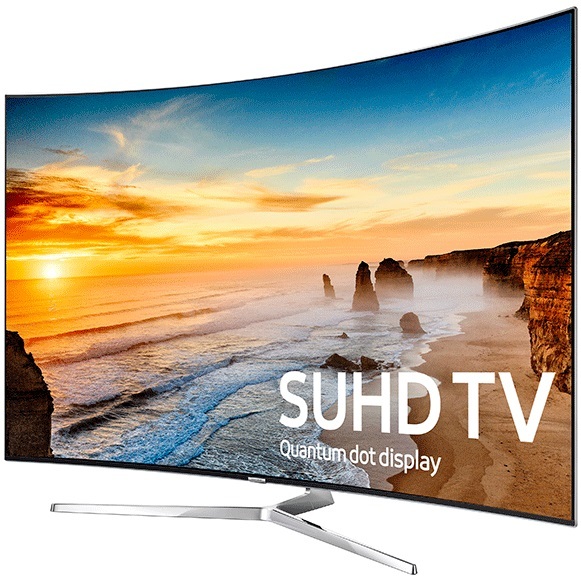 It comes with 4K UHD resolution and part of Samsung SUHD TV series. As the top model, Samsung UN55KS9500 is completed with quantum dot color as the new technology improvement from previous year’s Nano Crystal Color and PurColor technology. Quantum dot color is able to bring wider color spectrum so that you can enjoy more accurate color details. Samsung UN55KS9500 also comes with the new HDR 1000 technology that bring dynamic brightness so that you can see the details even in the dark shadow part of the screen. 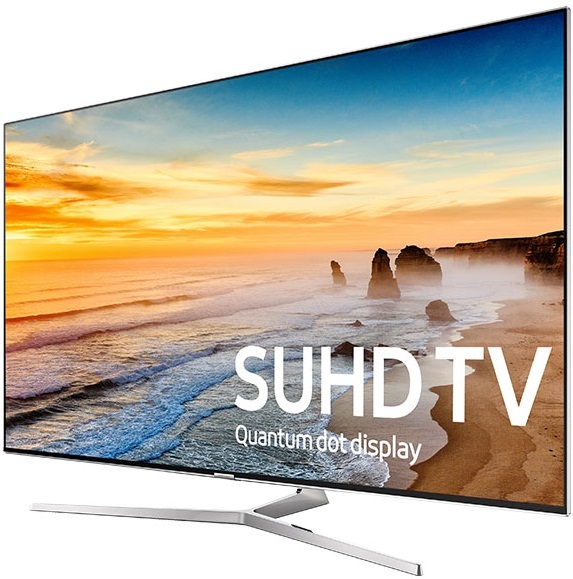 Samsung UN55KS9500 is also completed with the improved 2016 Samsung Smart TV that bring improvement to the 2015 Tizen based Smart TV platform. The Smart TV platform is completed with Smart remote that make it easier to control the TV and the Smart TV platform. If you still prefer flat screen panel than curved panel as your new TV model, then I’m quite sure that you consider Samsung UN55KS9000 as your new TV. It comes as the top model for 55-Inch flat Smart TV for 2016 lineup. Samsung UN55KS9000 is completed with the latest picture technology for 4K UHD resolution. You can find quantum dot color on Samsung UN55KS9000. With quantum dot color, you can enjoy wider color spectrum for more lifelike color details. The new HDR 1000 technology is also installed on Samsung UN55KS9000 that combined with peak illuminator pro and precision black to deliver vibrant color contrast on this TV screen. The new Supreme UHD Dimming technology also comes with this TV as the improvement from conventional UHD Dimming. On the Smart TV platform, you can find Tizen based OS that We can call 2016 Samsung Smart TV as the improvement from last year’s 2015 Samsung Smart TV. Before We compare Samsung UN55KS9500 and UN55KS9000, let’s take time and see the specs of those two TVs using the table below. On the table above, We can see the specs of Samsung UN55KS9500 and UN55KS9000. We can see that they have a lot of similarities and few differences. Let’s take a look at those specs one by one to see how They compared each other. Samsung UN55KS9500 and UN55KS9000 comes with different panel design. 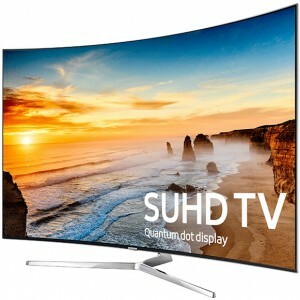 Samsung UN55KS9500 comes with curved panel design, while Samsung UN55KS900 use flat panel design. Curved panel design is intended to bring panoramic watching experience, but not everyone love curved panel. Some of the people prefer flat panel screen for their TV. Most of the aspects of picture technology of Samsung UN55KS9500 and UN55KS9000 are the same. They are both completed with 4K UHD resolution with the same LED backlight. They both come with quantum dot colors, HDR 1000 and Supreme UHD Dimming. With those latest technology, you can lifelike color details, vibrant brightness and brilliant picture from both original 4K contents or upscaled HD contents. The difference of those two TVs is coming from the depth enhancing technology. Samsung UN55KS9500 use auto depth enhancer, while Samsung UN55KS9000 use contrast enhancer technology. Essentially It’s not difference. It’s just the related depth enhancing technology that comes with the panel design. Curved panel design use auto depth enhancer, while contrast enhancer is used by flat panel Samsung TV. Samsung UN55KS9500 and UN55KS9000 come with Supreme MR 240. It’s an improvement from the conventional Motion Rate 240 that installed on 2015’s Samsung Top model TV and also still use on the lower model TV. With Supreme MR 240, you can get smoother motion images so that you can’t experience any motion blur whether you use the TV to watch your favorite movies and sports or play your favorite games. As the member of Samsung’s 2016 Smart TV, Samsung UN55KS9500 and UN55KS9000 come with the new 2016 Samsung Smart TV. 2016 Samsung Smart TV use Tizen OS as the previous 2015 Samsung Smart TV. Samsung improve the performance of their Smart TV platform so that you can enjoy better performance on Tizen OS using the new 2016 Samsung Smart TV. To complete the Smart TV platform, both of those two TVs are completed with Smart Remote control. Smart Remote control help you to control the TV easier and faster with voice interaction feature and few other smart function. But, both of Samsung UN55KS9500 and UN55KS9000 are not coming with any 3D feature. Looks like Samsung is quite confident that their top model TV is able to deliver 3D alike picture quality with the latest picture technology. Samsung UN55KS9500 and UN55KS9000 comes with the same speaker system. It’s 4.1Ch 60W speaker system. The speaker type is down firing with Tweeter. With 4.1Ch 60W speaker system, you can enjoy powerful immersive sound quality on both of UN55KS9500 and UN55KS9000. There’s a price difference between Samsung UN55KS9500 and UN55KS9000. Basically, Samsung UN55KS9500 is usually priced at $200 more price range than Samsung UN55KS9000. When We talk about percentage, Samsung UN55KS9500 is around 13% more than Samsung UN55KS9000. I think 13% is not a significant difference for many customers. What is the Reason to Consider Samsung UN55KS9500? Related Post To Samsung UN55KS9500 vs UN55KS9000 : What is the Reason to Consider Samsung UN55KS9500? You can find UN55KS8000 and UN55KU6300 from Samsung as two of the bestselling 4K UHD TVs in 2016. You may consider those two TVs as your next 55-Inch Smart 4K UHD TVs and asking about their difference. Samsung UN55KS8000..
Samsung QN55Q60R vs UN55RU8000 : Is Samsung QN55Q60R The One that You Should Choose? 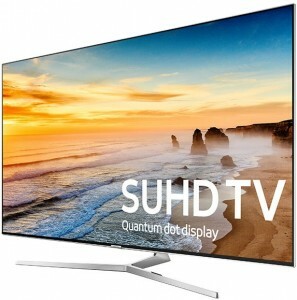 Two of 55-Inch 4K UHD TVs that we should consider in 2019 are Samsung QN55Q60R (QN55Q60RAFXZA) and Samsung UN55RU8000 (UN55RU8000FXZA) that introduced as part of their 2019 lineup. Samsung QN55Q60R comes as the basic 55-Inch QLED TV model,..
LG 55UF6800 vs 55UB8200 : Is LG 55UF6800 a Better New Model? LG 55UF6800 is the new model that can be considered as replacement model of LG 55UB8200. LG 55UF6800 is positioned on 2015 as the model below LG 55UF7600. LG 55UF6800 can be a good choice for you..